What a pleasant and delicious way to spend a few hours in the beautiful Hunter Valley. We were treated to lunch at Muse Kitchen, located in the Keith Tulloch Wine Estate where the humble lunch is taken to a whole new level at this stylish, yet relaxed restaurant. The Crispy Skin Confit Duck Leg and Confit Berkshire Pork were the pick of the day. The “crispy” in the confit duck was in fact “the best crispy ever” and of course what goes with pork other than crunchy crackling which was also fantastic. 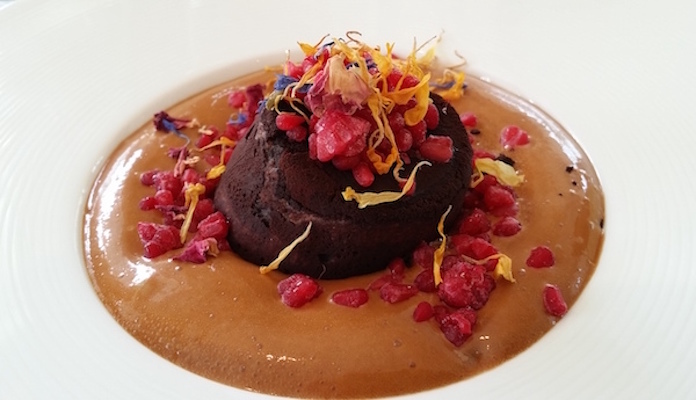 So on to dessert, what can we say other than Warm Chocolate Fondant! None of us here at Unwind could go past it. Warm gooey chocolate centred fondant surrounded by caramelised white chocolate and banana topped with a sprinkling of raspberry garnish. It was at that point that things went a little quiet while our tastebuds savoured every bite so you really must leave room for this decadent dessert. The service at Muse Kitchen is so friendly, helpful and efficient and this, combined with a wonderful selection of local wines to accompany the fabulous food, a visit to Muse Kitchen certainly is a “must do” next time you’re visiting the Hunter.